-Color will be either gray, blue or white. Picture is for demonstration purposes and not actual product. -Cable will work great if you are running inside a wall to two wall jacks in seperate rooms. 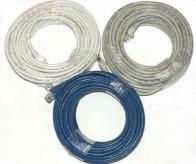 -We occasionally have left over bulk cable from a 1000ft spool after making custom length cables. We wrap the left over cable and set them aside in a bin. These are not patch cables thus the ends do not have RJ45 crimped on them. This is only the raw cable. -We usually just give these left overs away but due to higher copper prices we have decided to sell them cheap. -Sections will be from 45ft-55ft long. You will not get to choose your length or color. However, you may "request" your desired length(s) and/or color. If we have what you "request" we will be happy to send it to you. Send "requests" in "comment area" during secure checkout. 3. Must have a certain color.